Deep, dark brown color similar to used motor oil. Pleasant aroma of roasted malt. Coffee colored, vastly frothy head with tremendous lacing. Full bodied richness in mouth. Wonderful flavor of hops in taste. 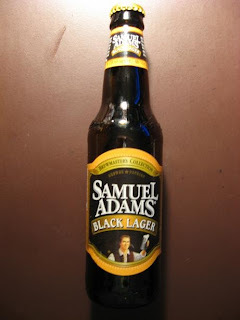 This beer is part of the 'Brewmaster's Collection' from Samuel Adams. I am not a fan of dark or black beers, but I thought this one was exceptional. The beer had definite tones of roast malt and caramel/chocolate. It poured out like a liquid gold candy bar. I mean, this was a really good beer. Most darker beers tend to be filling up front and get a tad bitter toward the end of the glass. I am very pleased that two of these bottles found their way into the casket. You can bet that the second Black Lager will be savored like the first!